It has been nearly four decades since we last saw a Triple Crown, and American Pharoah will face a tough task next Saturday facing a strong field that includes Frosted and Materiality, the second and third choices in early Belmont Stakes wagering. Frosted is the current second choice at Bodog at odds of 5-1. The colt was a fast closing fourth in the Kentucky Derby and skipped the Preakness. Trained by Kiaran McLaughlin, his breakthrough performance came in his final Derby prep when he won the Wood Memorial at Aqueduct. That race came after a fourth in the Fountain of Youth followed by a throat procedure which was performed to improve his breathing. McLaughlin is one of the top trainers in New York and saddled Jazil to an upset victory in the 2006 Belmont Stakes. Materiality is one of three potential contenders from the Todd Pletcher barn. The colt won the Florida Derby, and then checked in sixth in the Run for the Roses after a troubled trip. The colt is currently at betting odds of 15-2 at Bodog. Pletcher has won the third jewel of the Triple Crown twice in his career. He saddled the filly Rags to Riches to victory in 2007 and Palace Malice in 2013. Three of the last six Belmont winners (Palace Malice in 2013, Union Rags in 2012, Summer Bird in 2009) ran the Derby but skipped the Preakness. In addition to Frosted and Materiality, there are four others that fit that bill this year- Carpe Diem, Frammento, Keen Ice, and Mubtaahij. Of those six horses Frosted and Materiality seem to have the best shot of derailing American Pharoah’s Triple Crown bid. Backing the Kentucky Derby and Preakness winner in the Belmont Stakes is going to mean taking a very short price. The colt is currently at odds of 5-6 for the Belmont. We saw California Chrome go down to defeat last year at odds of 4-5. Other short priced favorites with a Triple Crown hanging in the balance included Big Brown, who was beaten at odds of 1-5 in 2008, and Smarty Jones, who finished second at odds of 2-5 in 2004. While everyone will be rooting to witness a Triple Crown, betting on it may not offer much value. 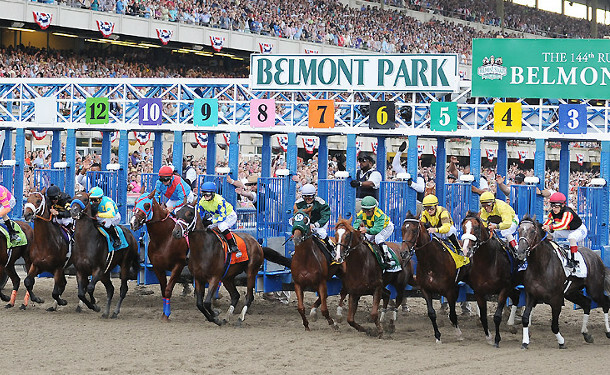 Michael Dempsey will be providing his full card handicapping report for Belmont Stakes Day at turfnsport.com.